After transitioning for just over 2 years I have experimented with twist-outs, braid-outs and bantu knots and admittedly, made so many errors. Now that I have chopped the majority of my straight ends off, I can now truly enjoy twisting without the added perm rods! I decided to refresh an old wash-and-go as I felt my curls has dried out and lost their definition. To do this I decided to apply two-strand twists using a new product, Aloe Curl Enhancing Twist Cream by Hydratherma Naturals and the results were amazing. It was the best twist-out I have ever applied so I have put together some of my tips for getting the perfect twist-out. 2. I started on dry hair and separated my hair into 4 sections on each side of my head. I sprayed each section that I was working on with water so that my hair was damp but not soaking wet. This helped the product to penetrate my hair and was easier for me to finger comb whilst twisting. I prefer to work with damp hair because it does not take as long to air dry, also. 3. Double up on products! If you are like me, you have thick hair and curls that dry out easily. So it is probably best to layer your products. I used the LOC method by dampening my hair, applying an oil and then a cream. This ensured my hair would still be moisturised the next day when I took down my twists. 4. Use products with hold and great natural ingredients. You do not want a twist-out that looks great to the eye but leaves your hair feeling sticky, flaky and dry. I used the Hydratherma Naturals Aloe Curl Enhancing Twist Cream. 5. Twist your hair a few hours before bed and then sleep with them under a satin scarf. 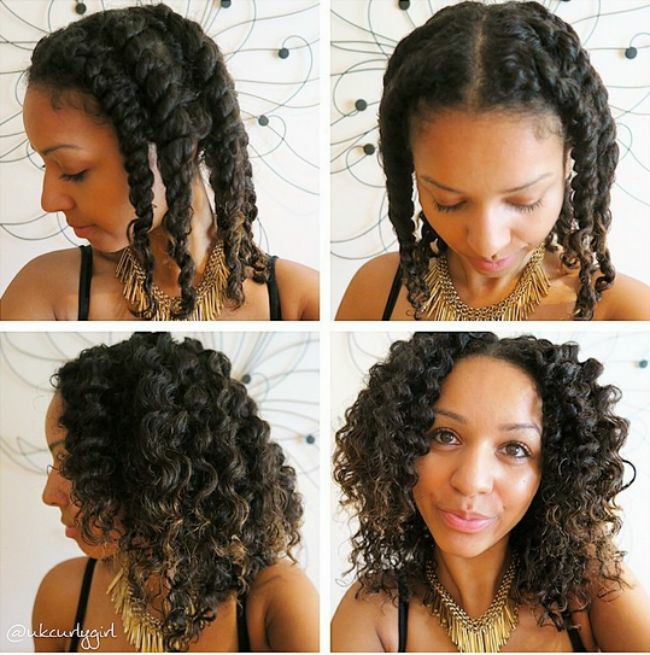 This is essential if you want your twist-out to be perfect the next day! The satin wrap will help to set the style and seal in all of the moisture. 6. Remember to apply oil to your hands while taking down your twists, as you want to smooth your hair out and prevent any tension which can cause frizz.